Someone at Motorola USA must have either been off his meds or suffering from a case of short memory. Appears things haven't been the same at Motorola ever since it got acquired by Lenovo. 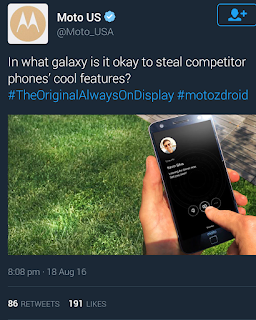 In accusing Samsung of stealing the Always On Display feature from it, Motorola has chosen to ignore where it got the idea from considering that Nokia's Symbian devices such as the N86 had one form of an Always On Display or the other even in it's feature phones. Considering that the Nokia N86 was in existence before Android became a thing and long before the first Motorola device (the Moto X) to have this feature, Can Motorola really claim the Always On Display as its own?. Methinks it's time that Motorola and Lenovo gets its duck in a row.